Notes about the greatest relief pitcher in history. "Exactly one year ago Friday, Yankees closer Mariano Rivera shredded his knee while shagging flies in Kansas City. He missed the balance of the 2012 season, and as a consequence many of us wondered whether Rivera had pitched for the last time -- or at least pitched up to his impossible standards for the last time. Well, that's what we get for even momentarily doubting Rivera. This season, the venerated reliever has pitched to a 1.59 ERA, 0.97 WHIP and 12.00 K/BB ratio and logged a majors-leading 11 saves. In other words, Mariano Rivera is still unmistakably Mariano Rivera. 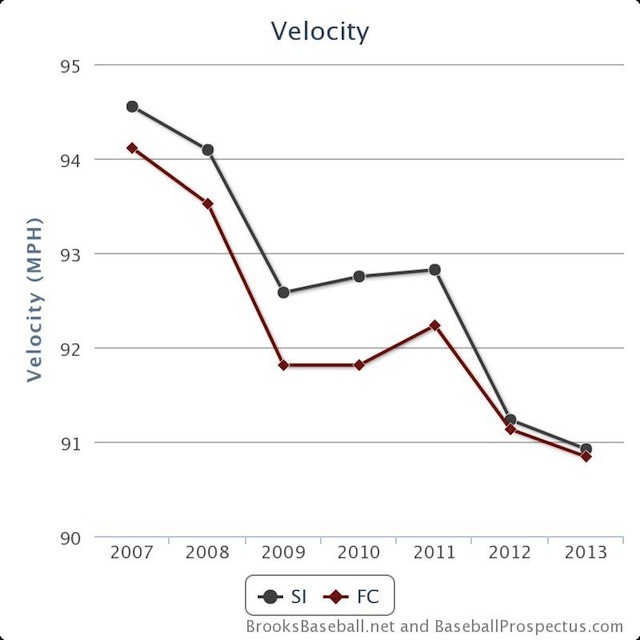 That, courtesy of Brooks Baseball, is Rivera's velocity chart (his famous cutter is indicated in red). What's important here is that Rivera isn't biologically superhuman among major-league pitchers. He gets older and his gun readings drop, just like the rest of them. But while guys like Tim Lincecum and Roy Halladay seem to be falling prey to diminished velocity, Rivera just does what he does -- run that cutter to his glove side and record out upon out upon out. 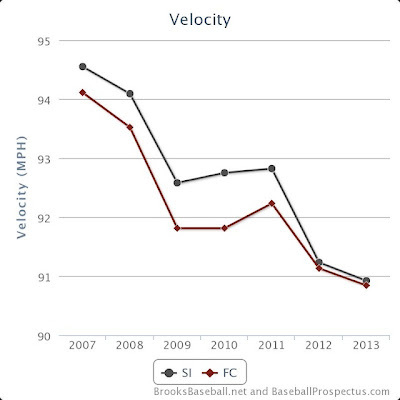 Call it adaptability if you like or call him a pitcher who was never beholden to the radar gun. Unfortunately, Rivera will make good on his promise to retire at season's end. But as this one-year mark passes, he's proved that not even middle age or serious injury can lessen him. I'll say something about him I've never said about another player and will surely never say about another player to come: I believe Rivera could play until age 50 and beyond and remain among the best. What a singular pitcher he is." "According to the data at Fangraphs.com, Rivera’s cutter is down to a career-low average of 90.3 mph. Still, his strikeouts per nine innings (9.53) and walks per nine (0.97) are significantly better than his career rates — and his career rates are great.